Nice little phone, nothing flash but a good choice for many. If you're looking for a budget phone - this one is pretty decent. But remember it's budget so don't expect the best performance in the world from it. Decent spare phone / phone for the kids or older parents etc. If you do take the risk; the lightinthebox coupons page has a £2.38 off voucher which can be applied to this. ( code 2017CMONDAY1 )Code doesn't work on the phone. 10% topcashback tracking may work. Just tried the code, shame it didn't work..
Insurance is their problem if it doesn’t turn up isn’t it? great price, especially for 32gb version. Ordered an item from light in the box in September, it still hasn't come. Got to wait 2 months while they "investigate". Won't give a refund till then. Insurance for duty costs. If you get charged, they cover it. Ordered an item from light in the box in September, it still hasn't come. …Ordered an item from light in the box in September, it still hasn't come. Got to wait 2 months while they "investigate". Won't give a refund till then. Didn't you pay using PayPal?? You should easily get money back through PayPal. I ordered this phone on Black Friday for £67.83 from LITB so great price and some heat. Just proves what a farce BF is though with sites inflating prices so they can reduce them again. Phone was dispatched yesterday/ today so a reasonable turnaround. I paid for shipping insurance which added an extra £1.59 to the order. I also went for snail mail shipping which hopefully will avoid the dreaded customs. Tracking seems to be spot on and much better than other companies I've used. I'm quite happy with the way things have went so far with this company. I expect a 2-3 week wait before the phone arrives. This was for my missus who won't have a clue on specs. Topcashback tracking 10.5% for me. Whether it pays or not is another question. It said quick tracking. Bought one to replace my 65 year old mums crappy Windows phone which confuses her and me. Excellent post and hits the nail on the head. SAR value for a under 16 year old, tick. inexpensive if / dropped, school friend runs off with it, tick. Brilliant deal. Whilst the specs aren't going to set the world alight for the cost, you will find it very hard to beat. 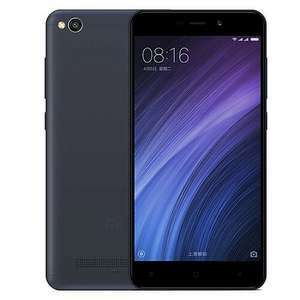 I have had the Xiaomi Redmi note 4 64gb, 3gb RAM and love it. This is for my wife for Christmas. 65 squid for a decent entry level phone with good reviews. Happy to see someone posted this. I had commented (https://www.hotukdeals.com/comments/permalink/32578789) but I swore never to post deals after abusive messages. Save yourself a fiver as it won't help. They just lose it or put it in the wash, or drop it down a well, or lose it in a wager or, "what phone?" Or ... You get the idea. Buy a zorb and put it inside that. That should give it a few weeks longevity. You could buy the G5 for £90 a few days ago. Arrived right away, worry free, you don't like it you send it back or they replace it for you in no time. Plus your dealing with a big UK company. 2 years warranty too. I wouldn't waste my time and money on this Cr....ap when there are alternatives like that. And Lenovo are what? British? And you've written "You could buy" but also it, "Arrived right away" - what tense is this? At least Xiaomi devices don't have bootloop issues which now comprise a class action against LG. Can you download Android apps on these phones? And Lenovo are what? British? And you've written "You could buy" but also …And Lenovo are what? British? And you've written "You could buy" but also it, "Arrived right away" - what tense is this? Your not the only one but it's irrelevant and you know it. I said this product is a Chinese bric-a-brac. I buy Chinese product as there's nothing else really but dealing with a Company based in that country can be a lot of hassle...it's a big problem that we depend on them so much but that's a different discussion. Last time I bought a product that was faulty and they asked me to record a video of it and send it over.. what?? They must be joking..I want them to deal with their faulty product..I need none of that kind of nonsense! Who cares about tenses?Your not the only one but it's irrelevant and you …Who cares about tenses?Your not the only one but it's irrelevant and you know it.I said this product is a Chinese bric-a-brac. Your a big joker aren't you? Shows at £77.23, am I doing something wrong or has price gone up? What on earth do you lot do with your phones that needs better performance than this? Filming Blue Planet III on it? I’m afraid he’s not. Are you skipping “you’re” year 2 English classes to comment? Sorry to point this out being the grammar police, but it is either "you are" or "you're" not "your". We have a great language so let us use it properly. I’m afraid he’s not. Are you skipping “you’re” year 2 English classes to co …I’m afraid he’s not. Are you skipping “you’re” year 2 English classes to comment? This or the ZTE Axon 7 MINI for £107 on HUKD? Axon 7 mini for Snapdragon 617, AMOLED screen, 3GB RAM etc. The hardware is almost flagship level. For updates however, I'd go with this. Xiaomi update their phones for years after release, it's a part of their strategy to sell the same hardware for an extended period and capitalise on falling component and assembly costs. ZTE are notorious for slow or nonexistent updates. Sorry to point this out being the grammar police, but it is either "you …Sorry to point this out being the grammar police, but it is either "you are" or "you're" not "your". We have a great language so let us use it properly. Euh, grammar Nazis. Do you correct people who mispronounce words too? Yeah, thought so. Some people are dyslexic. Do you make fun of deaf people? Get over yourself, there's no ego trip to be had here. This was a "lightning deal" which has since expired. I commented about this deal some time earlier, before it was posted as a deal, because I have sworn to never post deals again after receiving abuse. Sorry to those decent people who would have bought had it reached a higher temp sooner. This is now an old phone and will be sub 60 on similar deals. in the New Year. Euh, grammar Nazis. Do you correct people who mispronounce words too? …Euh, grammar Nazis. Do you correct people who mispronounce words too? Yeah, thought so. Some people are dyslexic. Do you make fun of deaf people? Get over yourself, there's no ego trip to be had here. How do you know they're dyslexic? I don't, and I didn't say they were dyslexic either. I said "some people are dyslexic". This is the point, when someone belittles someone about the way they write, how do they know whether or not that person has some disability that may affect the way they write? Regardless, no one should be made to feel ashamed of how they communicate - learning disability or not. What on earth do you lot do with your phones that needs better performance …What on earth do you lot do with your phones that needs better performance than this? Filming Blue Planet III on it? There is nothing in my post that should have made you jump to that conclusion. It's a budget phone. It'll give same performance as other budget phones. Specs make it look high end. It's not. It will lag at times. Actually, Dale wasn’t belittling anyone, I was. But I wasn’t belittling Andreas BECAUSE of the way he writes (that was just the instrument), I was belittling him because he was being an a&&$#@!. Being illiterate is no excuse for that. Actually, Dale wasn’t belittling anyone, I was. But I wasn’t belittling And …Actually, Dale wasn’t belittling anyone, I was. But I wasn’t belittling Andreas BECAUSE of the way he writes (that was just the instrument), I was belittling him because he was being an a&&$#@!. Being illiterate is no excuse for that. Where could u buy g5 for 90?